In biochemistry, lipids function as a large group of naturally occurring organic compounds that are soluble in non-polar organic solvents and insoluble in water. The primary functions of lipids in living organisms include: storing energy, signaling to cells, and making up part of the cell’s structural membrane. There is a diverse range of lipids that have varying chemical structures, but virtually all biological lipids are formed out of two distinct subunits: ketoacyl, and isoprene. 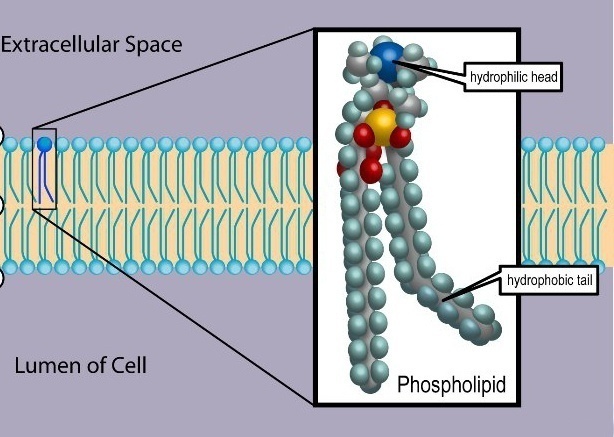 Since lipids are generally hydrophobic, they are often used in living organisms as part of the different membranes of cells to modulate the flow of water in and out of cells. The terms “lipids” and “fats” are often used interchangeably. but fats are actually a specific subgroup of lipids known as triglycerides. 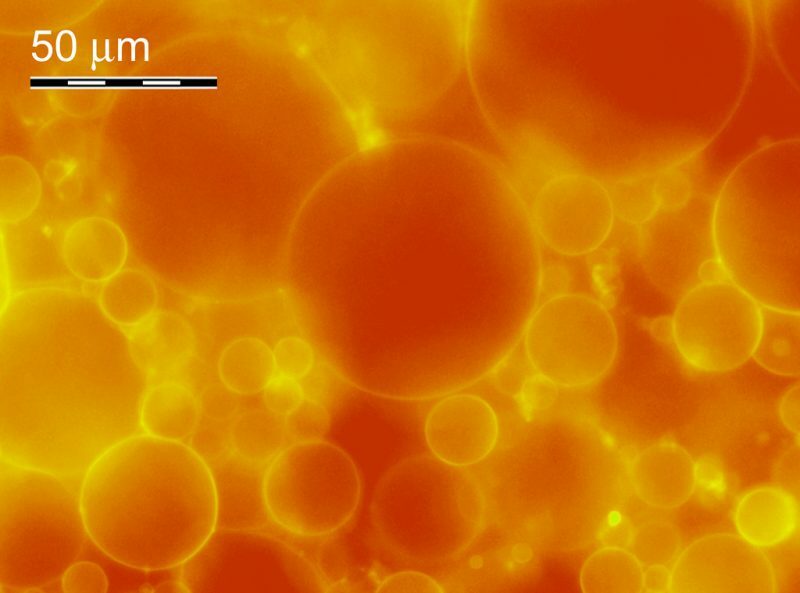 Most biological lipids are created via biosynthesis pathways in the living organism, but a handful necessary for life must be obtained from external sources. In total, biologists have identified 8 different kinds of biological lipids: fatty acids, glycerolipids, glycerophospholipids, sphingolipids, saccharolipids, polyketides, sterol lipids, and prenol lipids. The most common of these three categories are fatty acids, glycerolipids, and glycerophospholipids. Fatty acids consist of a hydrocarbon chain that is terminated with a carboxylic acid group. 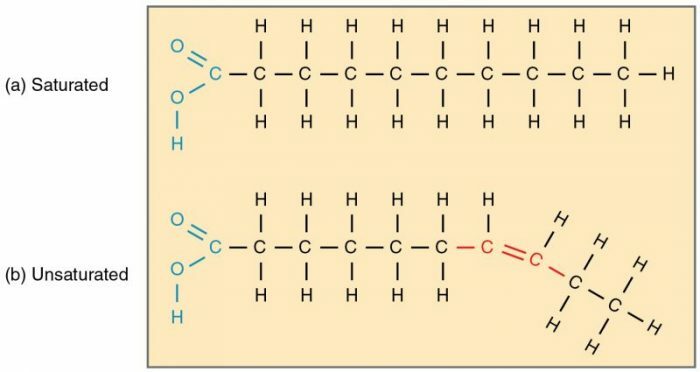 The result is that a typical molecule of fatty acid is amphiphilic—hydrophobic at the hydrocarbon end of the molecule and hydrophilic at the acidic end of the chain. Fatty acids are the most fundamental form of lipid and they are frequently components of other kinds of lipid molecules. Fatty acids are extremely important as fuel for living organisms as the play a crucial role in cellular respiration, the process by which organisms extract energy from nutrients. 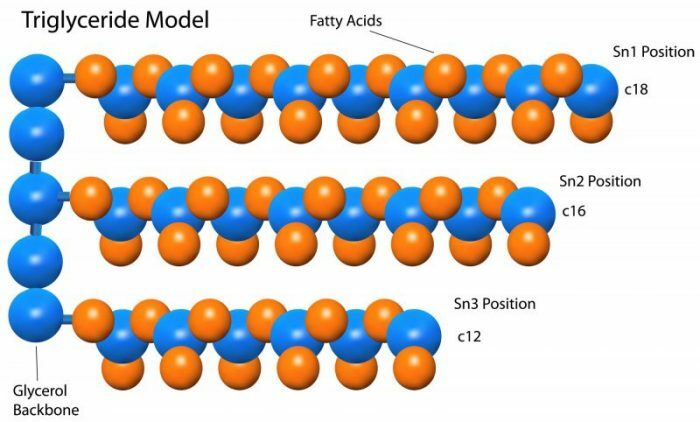 Depending on the exact nature of its chemical bonds, a fatty acid molecule can take on a number of different shapes, which affect the macroscopic physical behavior of an ensemble of those molecules. The presence of predominately single bonds between the hydrocarbon constituents will give a fatty acid molecule a linear shape. Conglomerates of linear fatty acids are typically solid at room temperature and are called saturated fats. If, on the other hand, the atomic bonds of a fatty acid contain double or triple bonds, the molecule will take on a bent shape. These fatty acids are called unsaturated and are generally a liquid at room temperature. Fatty acids are generally not found in isolation in the human body, but as parts of longer chains or organic macromolecules, such as glycerolipids. Glycerolipids are composed of mono-, di-, or tri-substituted glycerols. The most common glycerolipids are triglycerides, a molecule that arises from the affixation of three fatty acids onto a glycerol base. Triglycerides are one of the main constituents of body/vegetable fat in plants and animals and account for the majority of the mass of visceral adipose tissue. Triglyceride molecules are very energy dense and relatively stable, so they make an ideal substrate for long-term energy storage. Energy that is not currently being used is stored in the form of triglycerides, which forms two main types of tissue: white adipose tissue, which is used for storing energy, and brown adipose tissue which is used to heat the body. The hydrolysis of triglyceride and the release of fatty acids and glycerol is the first step in metabolizing fat stores. A triglyceride molecule. Triglycerides form when three fatty acids fill in the empty nodes of a glycerol backbone. 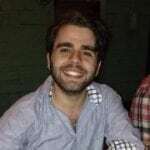 Credit: Wikipedia. As they are made from fatty acids which can be saturated or unsaturated, triglycerides can be saturated or unsaturated too. In humans, high levels of saturated triglycerides are linked with atherosclerosis and subsequently, increased risk of heart disease or stroke. High levels of triglycerides stimulate the production of low-density lipoproteins, which can stick together and cause problems with blood flow. Very often, regular moderate exercise and a carbohydrate-lite diet are sufficient to reduce high levels of triglycerides, but in some extreme cases, direct intervention via medication is required. Glycerophospholipids, sometimes just called phospholipids, are a form of lipid that is composed of two “tails” of hydrophobic fatty acids connected to a hydrophilic phosphate “head.” Phospholipids are ubiquitous in nature and are most commonly found as the main constituent of cell membranes. when placed in an aqueous solution, the hydrophobic tails will orient themselves to minimize contact with water. The result is a sheet of phospholipids with all the heads and tails oriented in the same directions. In biological organisms, two sheets of phospholipids will come into contact, making a membrane that consists of hydrophilic phosphate heads point outward in either direction, with the tail fatty acids point inward. This is a phospholipid bilayer and is one of the most important biological structures in eukaryotic organisms. It forms the outer membrane of the cell and is the main structural component of intracellular organelles such as vesicles and vacuoles. The structure of a phospholipid molecule and the phospholipid bilayer. The hydrophobic action of the tails causes them to cluster together to avoid water. Credit: Wikipedia. In addition to composing the actual physical structure of the lipid bilayer, the amphiphilic properties of phospholipids assist in the transport of materials through the membrane The lipid bilayer allows for the transport of small molecules like oxygen, carbon dioxide or water, but keeps out larger objects like proteins or foreign pathogens. Phospholipid molecules can also be split into products that assist in various signaling process throughout the cell, such as in the removal of dead cells or cell components from apoptosis. There are many other kinds of lipids that play different roles. Saccharolipids are similar to glycerolipids, exchanging a saccharide base for a glycerol base. Saccharolipids are a main constituent of the outer membrane of Gram-negative bacteria. Polyketides are a family of lipids whose antimicrobial properties are frequently used in disinfectants and antibiotics. Other lipids are necessary for the uptake of fat-soluble vitamins K, D, E, and A. Overall, lipids form one of the largest and most diverse classes of biological molecules, and they are involved in almost every organismic process. Previous Post« Previous Hippocampus Function: What Does It Do?